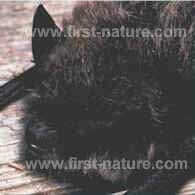 Whiskered Bats are small with pointed faces well covered in dark hair. Typically, they have a head-and-body length of 35 to 48mm and weight between 4 and 8gm. Another distinguishing feature is the very dark (almost black) pattern of wing membranes. Whiskered Bats are found throughout Wales but are not particularly plentiful. 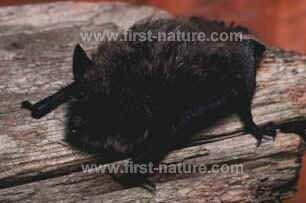 They are close relatives of Brandt's Bat and distinguishing the two species can be difficult. This is another species you will see on the rivers and lakes of Wales, although they seem less fond of woodland and more of open areas. Whiskered Bats emerge at dusk. Often they can be seen seeking insect prey along the banks of rivers, canals and lakes, and you may also see them hunting in woodland clearings. Not a great deal is known about the behaviour of whiskered bats, but they are known to roost in buildings in the summer months. It is likely that some also roost in trees, and they have been known to make use of bat boxes. Maternity colonies usually number between 30 and 70 bats, but up to 200 have been recorded at one site. Whiskered Bats retreat early to their winter underground roosting sites - sometimes as early as September - but they are one of the first species to emerge in springtime, generally in late February or early March. They roost mainly in solitary positions, hanging free, and are reportedly more tolerant of cold locations than their relatives the Brandt's Bats. In very cold winters, they move to warmer, inner parts of caves.